Why Haven’t the A’s had Any Good Pitch-Framers? The ability to quantify the value of catcher framing has been one of the biggest sabermetric breakthroughs of the last decade. By parsing through PITCHf/x data, analysts like Mike Fast, Max Marchi, Dan Brooks, and Harry Pavlidis have managed to shed light on which catchers are adept at turning balls into strikes, uncovering hidden value in otherwise unremarkable players, including Rene Rivera, Chris Stewart, and of course, Jose Molina. MLB front offices have taken notice. Several teams, including the Yankees, Rays, Red Sox, Pirates, Padres, and Brewers have begun hoarding good-framing catchers over the past few years. But one team that’s missing from this list are the Oakland Athletics, who have historically been among the first adapters of sabermetric principles. One would think that the A’s would be all over the Jose Molina‘s and Chris Stewart’s of the world, yet Billy Beane and co. seem to have missed the memo on acquiring good framers. In fact, they’ve made a habit of employing poor ones. According to Baseball Prospectus‘ model, A’s catchers rank fourth from last in framing runs saved this season. This isn’t a one year anomaly, either. Here’s a look at all of the catchers the A’s have used since 2010, along with their career framing numbers. That right there is a pretty sorry group of framers. There’s not a single catcher in the group who’s even above average. So what gives? Why has Billy Beane — who’s nearly synonymous with the term “market inefficiency” — been so reluctant to exploit the latest market inefficiency? 1) The A’s have chosen to employ catchers who excel in areas other than pitch-framing. 2) The A’s aren’t completely buying into all of this pitch-framing stuff. Let’s start with the first explanation. Since 2010, A’s catchers have accumulated 12.1 fWAR (which doesn’t account for framing), putting them 15th out of 30 MLB organizations. But since 2012, the year after Mike Fast’s research first brought the value of pitch framing to the public’s eye, the A’s rank 10th. The average wRC+ from a catcher is 93, but the A’s have done much better than that of late by employing guys like John Jaso (136 wRC+) and Derek Norris (110 wRC+). Even if you were to dock the Oakland’s catchers for their poor framing skills, they’d still fall somewhere in the middle of the pack in terms of total value. Basically, the A’s have managed to find good, cheap catchers, who generate value in ways other than framing pitches. Plus, for all we know, the A’s might have reason to believe these guys excel in other overlooked areas. They could be superb game callers, for example. But that can’t be all that’s going on. Sure, the A’s have done a decent enough job of finding catching talent without prioritizing framing, but it’s not like they’ve had Mike Piazza or Johnny Bench behind the plate. Jaso and Norris are fine players, but aren’t exactly superstars. Plus, it should tell us something that they haven’t even brought in any bottom-of-the-barrel framing specialists. Eric Kratz or Chris Stewart were both traded for warm bodies last winter, but the A’s instead chose to roll with Vogt as their primary catching depth. Oakland’s brain trust is about as progressive as they come, and have a proven penchant for unearthing value from unlikely places. When a team like that zigs while others zag, it probably makes sense to ask why. This isn’t to say that the publicly-available framing data is useless, as having a good framer undeniably adds some value, even if it’s only a few runs. But the fact that the A’s have yet to employ a single plus framer should lead us to wonder if there’s a piece of the puzzle we might be missing. Statistics courtesy of FanGraphs and Baseball Prospectus. We hoped you liked reading Why Haven’t the A’s had Any Good Pitch-Framers? by Chris Mitchell! The Blue Jays too, generally an analytics-favouring team, they could have easily kept Jose Molina around for cheap and basically just dumped him. This is true. But they’ve also hired Sal Fasano to help their catchers learn to become better framers, which had a huge impact on Arencibia’s defense. They also traded for Eric Kratz last winter. The A’s on the other hand, seem pretty much indifferent to the whole framing thing. For all the hours they were together, Fasano was teaching the catchers how to improve on the three areas of catching: Receiving, Blocking, and Throwing. If you are wondering why framing is not on that list, it is because, as Sal told me, “Framing is what carpenters do. What I teach is receiving”. Not knowledgeable enough to figure out if As pitchers pitching more up than down in the strike zone compared to others, getting more pop outs, especially foul outs, than ground balls, compared to others. 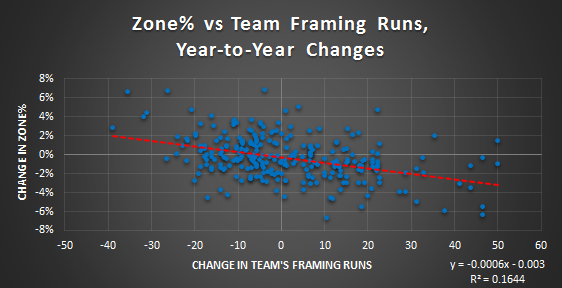 With framing more difficult up in the zone, and staff tending to pitch up, less opps for framing effects to become apparent. With all the foul territory in Oakland, is it possible they’re looking for outs, not just strikes, by pitching up in the zone….on purpose. Anyone?